In my Introduction to Programming classes I am using Processing to introduce graphics, Java, and Android development. Starting with a CS4HS Workshop at UofW this summer I am beginning an exploration that will make this class more fun, closer to CS Principles, and setup students for success in IB. I completed a class using Java to draw images, then a class using variables to have the students faces “sing” by changing shapes and sizes based on the volume of a song they choose. 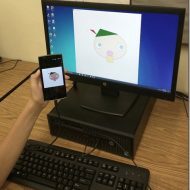 Then, today, they attempt to actually publish the code to their phone, install the Java software development tool we are using on their phone, and run a simulator on the PC. 3 ways to program for a phone. Fun stuff as seen in the image.